No matter what you may think about the Italian judicial system, it must be far better than that of the United States that convicted Troy Davis, held him as prisoner for over 20 years for a crime he may have not committed, and then paid the ultimate punishment, death by lethal injection. The overturned conviction became known just moments ago in Italy as American Amanda Knox was found innocent of murdering Meridita Kercher 4 years ago. The following is an excerpt of a CNN report from Perugia, Italy, just hot off of the press. Perugia, Italy (CNN) -- A jury cleared Amanda Knox of murder and other charges on Monday, nearly four years after she was arrested on suspicion of having killed her roommate in this picturesque Italian university town. The jury evidently believed Knox's impassioned final statement to the court, delivered in a voice trembling with emotion. "I am not what they say I am -- perverse, violent. ... I haven't murdered. I haven't raped. I haven't stolen," Knox said in the most important speech of her life. She and her defense team succeeded in overturning a conviction handed down two years ago by a different jury, which found her and co-defendant Raffaele Sollecito guilty of killing of Kercher, who was sexually assaulted and killed. Her throat had been slashed. "I am innocent," Knox said Monday. "Raffaele is innocent." Sollecito put his claim simply in his own closing statement before Knox spoke. "I have never hurt anybody," he said. As he concluded, he dramatically removed his plastic "Free Amanda and Raffaele" bracelet, saying: "I have never taken it off since it was given to me. ... I think now is the moment to take it off." His voice almost inaudible, he concluded, "I hope this is part of history and that Amanda and I have a future." Knox's lawyer Luciano Ghirga reminded the jury Monday that they had to be convinced "beyond a reasonable doubt" that Knox and Sollecito were guilty if they were to uphold the conviction. At least four members of the jury -- composed of six members of the public and two judges -- must have concluded they did, indeed, have doubts about her conviction. A majority ruling was all that was needed to throw out the conviction, with a tie favoring the defense. The actual vote will remain secret, but the main judge, Claudio Pratillo Hellman, will file a statement explaining the jury's reasoning within 90 days of the ruling. 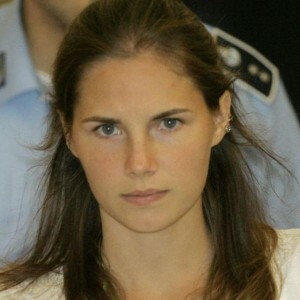 Knox and Sollecito were convicted of murder, sexual assault and related crimes related to Kercher's death in December 2009. A third man, drifter Rudy Guede, was convicted separately of involvement in the killing and is serving 16 years. In the appeal, lawyers for Knox and Sollecito picked apart DNA evidence that played a role in the original conviction. Part of the original prosecution case was based on DNA evidence found on a knife and on a bra clasp belonging to Kercher. During the appeal, experts for the two sides battled over whether the DNA evidence was reliable. They also fought over the character of Knox. The lawyer for a man falsely accused of the crime called Knox "Lucifer-like, demonic, Satanic," while Sollecito defense counsel Giulia Bongiorno insisted that, like the buxom cartoon temptress Jessica Rabbit in the movie "Who Framed Roger Rabbit?" Knox is not bad, just "drawn that way." Knox herself acknowledged the debate Monday in her closing statement. "People always ask 'who is Amanda Knox?'" she said. "I am the same person I was four years ago. ... The only thing that now separates me from four years ago is my suffering. "In 4 years, I've lost my friends in the most terrible and unexplainable way. My trust in the authorities and the police has been damaged. I had to face charges that were totally unfair, without any basis. And I am paying with my life for something I haven't done." Knox was 20 and Kercher was 21 years old, studying at Perugia's university for foreign students, when Kercher's semi-naked body was found in the house they shared. Sollecito, 23 at the time, was Knox's boyfriend, studying computer science at another university in Perugia. Either side can appeal this court's ruling to Italy's High Court, but such an appeal would be on narrow technical grounds only.